During warm weather or rainy seasons, many people discover ants entering their houses and garden areas. According to the Texas Imported Fire Ant Research and Management Project, ants are social insects and live in colonies that may range in size from hundreds to millions of ants, depending on the species. There are different types of ants, but the most common house-invading ants include pavement, carpenter, acrobat, pharaoh and odorous house ants. Dealing with ants can be very frustrating. Pesticides for ants contain chemicals that are harmful to humans and the environment, but there are some natural, non-toxic ways to control ants. These may take some time and patience, but will provide good results. Here are the top 10 ways to get rid of ants naturally. 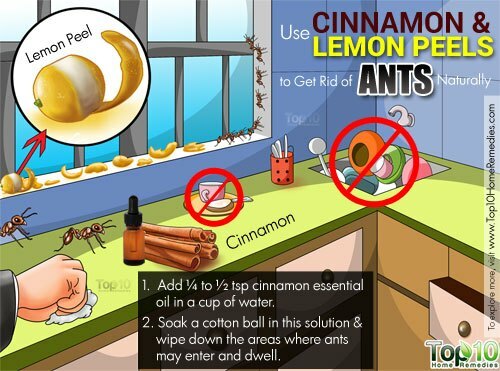 Cinnamon is an effective household ant repellent. Its smell discourages ants from entering your house and scrounging in your kitchen. According to a 2014 study published in the International Journal of Scientific and Research Publications, cinnamon essential oil yields positive results in both repellency and insecticidal activity. Add ¼ to ½ teaspoon of cinnamon essential oil in a cup of water. Soak a cotton ball in this solution and wipe down the areas where ants may enter and dwell. Repeat once daily until all the ants are gone. You can also put ground cinnamon and whole cloves near entry points. Note: Use the cinnamon oil spray strategically in places of ant infestation; do not put it all over the place. White vinegar will also send an eviction notice to ants on your premises. They cannot bear its strong smell. In addition, the smell masks their scent trails, making them lose their direction. Mix equal parts of white vinegar and water. Add a few drops of any essential oil and shake the bottle thoroughly. Spray this solution around baseboards and other entry points. After an hour, wipe up the ants using a damp paper towel and discard them. Repeat once daily until the ants are completely gone. You can also use this vinegar solution to clean floors, windowsills and countertops to prevent ants from crawling over these surfaces. Borax is toxic to ants and helps rid them from your house and garden. Ants are attracted to it and, when ingested, it ultimately kills them. Mix equal amounts of borax and food jelly. Put it on a flat plate in the areas where you have ants. Alternatively, mix borax with granulated sugar in a 1:3 ratio. Add enough water to get a syrup-like consistency. Put this paste in the areas where you see ants. Another option is to make a paste with equal amounts of borax, cornmeal and a few drops of water. Spread the paste in areas where you tend to see ants. Note: As borax is toxic, keep it away from pets and small children. 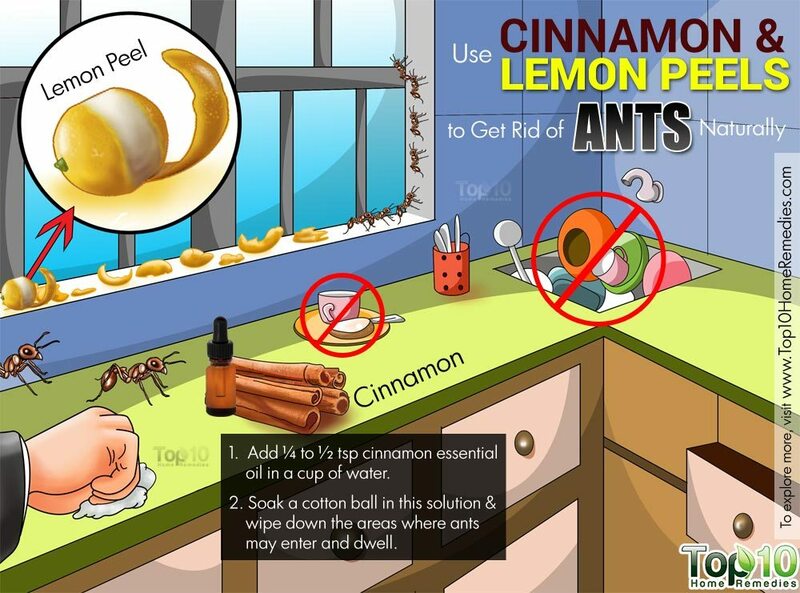 To make your kitchen and other areas of your house ant-proof, try lemon. The smell deters ants and its acidic property masks their scent trails. Rub some lemon juice on door thresholds, windowsills and other possible areas where ants are getting in. Another option is to put a few drops of lemon essential oil on cotton balls and leave them in cabinets and other areas as needed. Scatter small slices of lemon peel around outdoor entrances. Use these remedies every few days until the ants are completely gone. Peppermint is a natural insect repellent that can effectively keep ants away. Ants hate its strong smell, which also disrupts their smelling capabilities so they cannot detect food sources. Add 10 drops of peppermint essential oil to 1 cup of water. Spray the solution on all areas where ants are present. Repeat twice daily, until the ants are gone completely. Sprinkle some dried peppermint around your doors, entryways and garbage areas to repel ants. Food-grade diatomaceous earth (DE) also works well as an ant repellent. This powder is the fossilized remains of marine phytoplankton. The microscopic razor sharp edges of DE can cut through the ants’ exoskeletons, gradually causing their body to dry out. Gently sprinkle a thin layer of DE on windowsills, beneath the fridge, under cabinets, in and around garbage cans and any other places where you see ants. Repeat once daily until all the ants are gone. Another age-old trick to get rid of ants is cucumber peel. Ants have a natural aversion to cucumber, as they cannot stand its taste. Bitter cucumbers work best, but you can use normal cucumbers, too. Place pieces of the peel in all areas where you have seen ant activity. Replace them with fresh peels daily. Repeat as needed until the ants are gone. 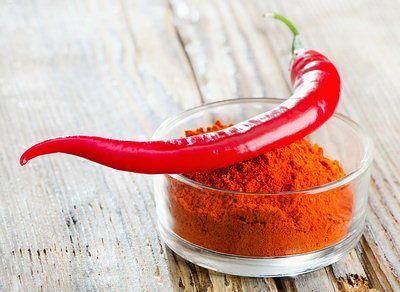 Cayenne pepper also works as an effective ant repellent. The strong nature of cayenne pepper destroys the chemical signals that ants rely on to navigate toward food, their nest and other places. Without a proper signal, ants will not able to survive and will thus look for new places to go. Sprinkle cayenne pepper powder in areas where you notice ants. You can also mix equal amounts of cayenne pepper and turmeric powder and sprinkle it across the access points to make an unpleasant barrier for ants. Dish soap also works as an effective ant repellent. It can help suffocate the ants, causing them to die. You can try this tip on cockroaches, too. Mix 1 teaspoon each of liquid dish soap and baking soda in a cup of water. Spread this solution along areas where ants are coming in. 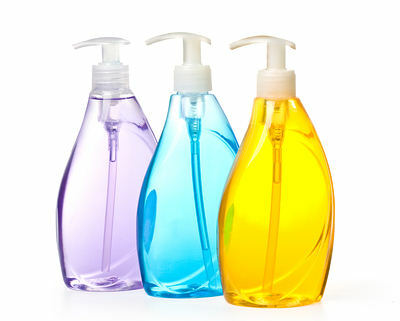 Fill a spray bottle with one part dish soap and two parts water, then shake it thoroughly. Spray the mixture over the areas where ants are present. After a few hours, wipe up the dead ants with a wet cloth. To deter ants from entering your house, you must take extra care to keep it clean. Do your best to keep your floors, countertops and cabinets clean and free of clutter. Keep food containers tightly sealed, especially those used for storing sugar, honey, syrup and other foods that can attract ants. Make sure to properly cover any food that you leave out on the kitchen counter. You can even place bowls of food on plates containing a little water to prevent ants from reaching the food. Clean furniture surfaces and windowsills regularly. bay leaf works wonderfully – leave for a few days and ants do not return! To keep away the ants turmeric powder is the easiest way , sprinkle small quantity and the ants gone for ever.